Zhinka dinka doo: Happy new year! 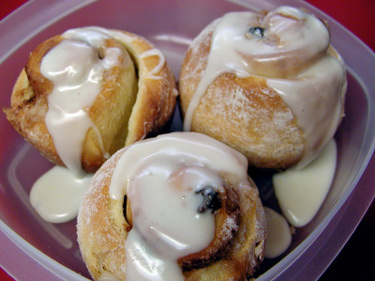 I wish I could invite everyone over for some homemade cinnamon sweet rolls! These are glazed and ready to go on an outing with us today, a playdate for Max with a friend from school. Yesterday, I promised Max a "surprise" for breakfast today, and I had these in mind. They're a yeasted dough recipe from my old Betty Crocker cookbook, and they require two risings. Last night around 11:30pm as I was getting ready for bed, I suddenly remembered my promised surprise and reluctantly mixed, kneaded, and set the dough out to rise. This morning I shaped, let rise again, and baked. Although I was reluctant to get these going last night, I must say they were worth it. Yum! I wish a sweet, full new year for everyone! ohhh yum.... I hope your new year play date surprise went well. oh that sounds and looks fab! i think i can smell them from here! They look delicious! Happy New Year! It is five in the morning as I read this and I would just love a hot cup of coffee and two of those fabulous looking rolls. Thanks for just the lovely photo.